This year has seen a flurry of activity in the garden. The year started with 'Consumer Home and Garden' publishing an article on our front garden, showing it at its very best, of course. Its looking very mature now, and native tussocks and grasses are definitely making a take-over bid (a process Andy is happy to help, as they not only look good, but suppress the weeds). Given another five years, all the tatty holes where things are refusing to grow (and fill with weeds continually) might be filled in with tussocks. The back garden is coming along slowly. With greater fertility, any bare soil becomes a two-foot high mass of weeds in about a fortnight (even in winter), so Andy has resorted to weed mat everywhere he can (and its still a battle with the weeds). Of the fruit tree that Andy planted last year, we have harvested: 3 apples, 2 grapefruit, one mandarin, about a dozen strawberries, about 5 pounds of rhubarb, and no apricots, peaches, feijoas, plums, medlars, grapes, kiwifruit, blackberries or sapotes. Only cape gooseberry has done well, with a handful of fruit daily all winter long. Still, its early days. 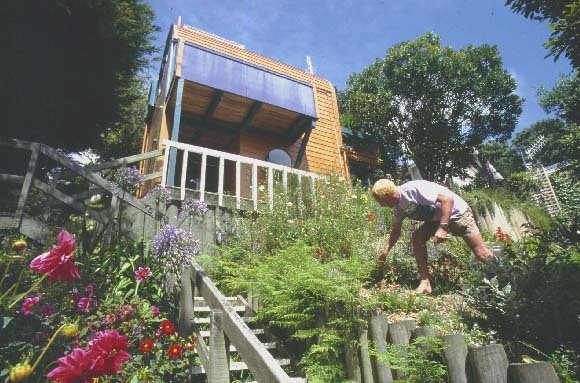 The present project is the ornamental garden around the shed (see The Great Shed Saga). Railway sleeper steps pass the outdoor baths (still to be plumbed in), and a cactus garden (still to be planted) on one side, with a leafy, tropical look border on the other side. This has just been planted with large leaf species Rhododendrons, Cannas, and palms, with a tree fern grove as backdrop. Hoping for another magazine article in a couple of years! 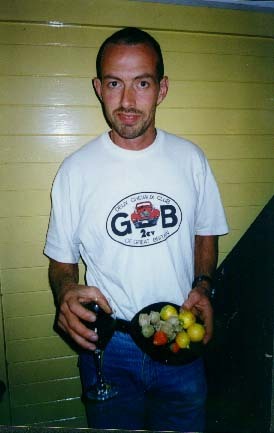 Andy displaying the "fruits" of his labours. Based on the amount invested in the back garden each piece of fruit harvested to date has cost about $400!! Verticle Element & Nest Trap in back garden.